To enter a payee for your check, click 'Payee List' to pick from a listing of your Vendors, Owners, or Tenants. This will allow you to add new Vendors into your database directly from this screen. You can choose which ledger to post the transaction to from the 'Post To' list. 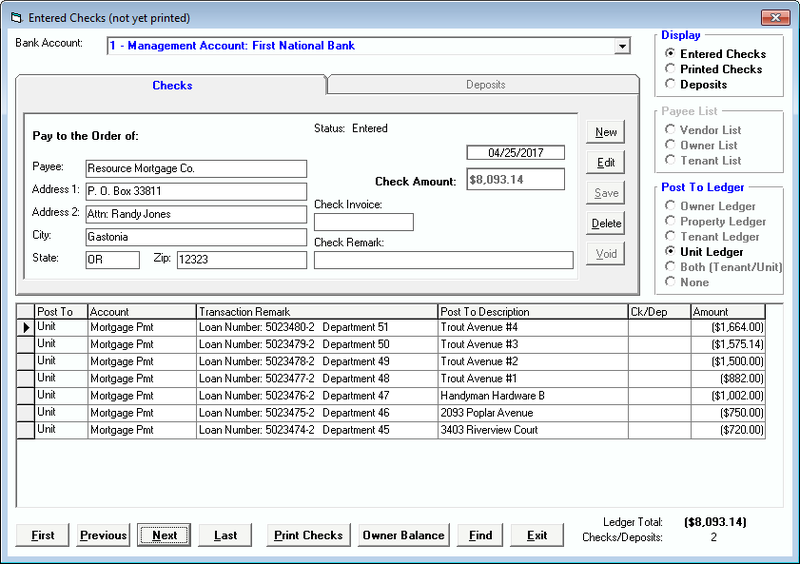 Multiple postings can be assigned to one check and posted to any ledger. The check will total as you enter each transaction. Not sure of the owner's balance? Click the 'Owner Balance' button to see the current balance for any owner in the Tenant File. It is also easy to find a check by check number or by the payee name. Scroll through the checks using the navigation buttons at the bottom. When it is time to print your checks, just click on the 'Print Checks' button at the bottom of your screen. Nothing could be easier. To order Tenant File compatible checks, click the 'Order Checks' button on the 'Print Check' screen for pricing and order information.